If you have a septic tank on your property, then it is important to preserve your septic tank drainfield. If it becomes damaged, then it’s going to affect your septic tank and cause you a lot of expensive and messy problems. Luckily, taking care of your septic tank drainfield is easier than you might think. These are some of the things that you can do as a homeowner so that you can prevent septic tank drainfield problems. First of all, one big mistake that a lot of people make when they have septic tanks is using too many chemicals in their yards. If you use chemicals in your yard, then you have to worry about those chemicals having an impact on your septic tank drainfield. After all, healthy bacteria is a necessity for a healthy and effective drainfield, and the chemicals can kill the healthy bacteria or affect the balance of bacteria. Another common mistake that people make when it comes to their septic tank drainfields is driving over the drainfield. Doing this a time or two probably will not cause any damage or be a big deal, although it should be avoided if possible. If you do it regularly, or if you park on top of your drainfield, though, this can have a big impact on the drainfield. Therefore, it’s definitely important to avoid the drainfield when driving or parking your vehicle. If you’re going to be hosting an event at your home at some point and will have a lot of people parking on your property, you may want to mark off the drainfield area so that your guests can avoid it. Just as it’s not a good idea to drive or park on top of your drainfield, it’s also not a good idea to build on top of your drainfield, either. If you are thinking about building a storage building in your backyard, for example, you will want to make sure that you do not build it on top of your drainfield. If you do, then eventually, the weight of the structure could have an impact on your drainfield. 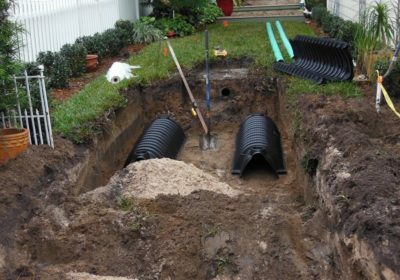 Plus, if there are problems, your septic tank repair and maintenance professional will not be able to get a good look at the problem or handle septic tank drainfield repair Sarasota FL easily if there is a structure in the way. Therefore, before you start building, you will definitely want to make sure that you’re aware of the location of the drainfield so that you can avoid it. Septic tank drainfield problems can cause you a lot of issues. You should not have to deal with these problems, though, if you follow the steps above. You can also ask your septic tank repair and maintenance professional for advice about what to do regarding the care of your drainfield and septic tank. Then, you can help avoid having any septic tank problems on your property.